The Sand Point City Dock was constructed in 1984 as a pile-supported structure. It currently rests on the western side of the New Harbor breakwater. The city dock currently serves as a multi-function dock acting first and foremost as a shipping and receiving terminal for commercial goods, services and industry, as well as a service terminal for the Tustumena ferry. The dock receives barge service weekly from Seattle throughout the year. The dock also handles processed seafood via shipping container vans regularly. 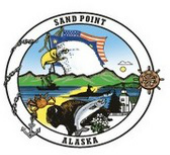 Given the lack of road access to the city of Sand Point, the city dock is an essential component of infrastructure providing critical access between Sand Point and the Pacific Northwest region. The City is currently seeking funding resources to replace the aging dock. The dock replacement is part of the State of Alaska's ﻿﻿﻿﻿STIP program﻿﻿﻿﻿. PND Engineers in 2015 prepared an Alternatives Analysis Report of four dock concepts with preliminary design engineering. A "dual dock" design concept was chosen as the preferred alternative (see sketch below), keeping the original structure and building a separate new structure directly adjacent. This concept would create more than 440 feet of true dock platform space. In October 2015, PND Engineers was awarded the design and environmental permitting contract from DOT to start immediate work on the replacement.